Taken between 9:10-9:30 AM CST from St. Louis, Missouri. (Captured to computer from VHS recording). 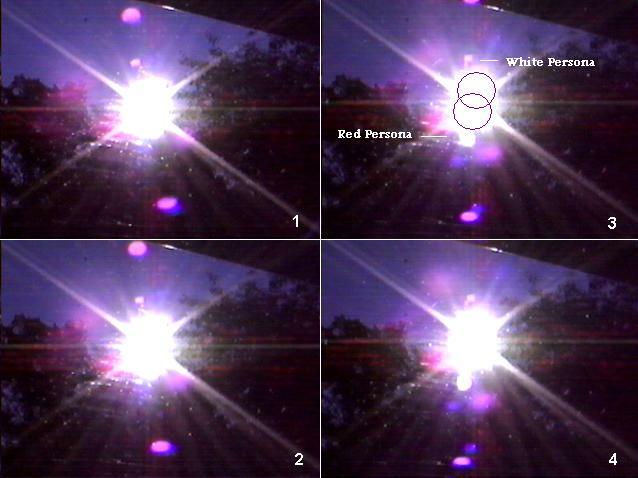 Here the crisp White Persona is seen above the Sun and along the Ecliptic where Leo the Lion touches the Ecliptic, and the Red Persona, larger and a brighter splash, has placed itself at the 7 o'clock position. They have caused the normal vertial/horizontal flare of the Sun to skew into a cross.